Guitar Slim was a man ahead of his time. He was a talented songwriter, a fine guitarist, and a powerful vocalist, but he was an incredibly flamboyant performer who influenced just about every blues performer from Mississippi or Louisiana who strapped on a guitar during the ’50s. You may know a few of them --- Buddy Guy, Earl King, Guitar Shorty, Albert Collins, Chuck Berry, Chick Willis, Jimi Hendrix, and Billy Gibbons, to just name a few. He was renowned for his bright red, green, and blue suits (with matching shoes and hair) and the extra 300 feet of guitar cord that he used when he walked out into the audience (or into the street) during his performances, occasionally stopping traffic while tearing into a guitar solo. Slim recorded for Imperial Records, Specialty Records, and ATCO Records between 1951 and 1958, totaling 30 tracks. He’s best known for “The Things That I Used To Do,” which became a huge hit, selling over a million copies and spending 14 weeks in the Number One spot on the Billboard R&B charts. Sadly, Slim didn’t make it out the 1950s, collapsing on a stage in Newark, New Jersey in February 1959 and passing away the next day in a New York hospital at age 32 from pneumonia caused from extremely hard living and drinking. While Specialty and ATCO have both released their own collections of Slim’s recordings over the years, showcasing the singles released for their respective labels, these outstanding tracks have never been released as a complete set. Until now. 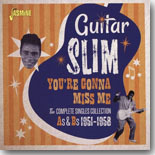 The U.K. label Jasmine has released a retrospective CD that finally collects all of the 15 singles that Slim released during his lifetime: You’re Gonna Miss Me: The Complete Singles Collection A’s & B’s, 1951-1958. One of the things that helps Guitar Slim’s music stand out from the rest of the ’50s blues crowd is his raw, primordial sound. Backed by a trio on the first few tracks, then with a larger band and horns in later recordings, the common factor was Slim’s powerful and heartfelt vocals and his guitar, which wasn’t distinctively different from others at the time. That fuzz-tone that he used would also come into play with other artists down the road, including the previously-mentioned Guy, Hendrix, and Gibbons. He also appeared to be as passionate a performer in the studio as he was in the juke joint. Those standout tracks that are still played and covered 60-plus years later are all here. The wonderful slow blues “Trouble Don’t Last” and the title track still pack a wallop, and tunes like “The Things I Used To Do,” “Well, I Done Got Over It,” “The Story of My Life,” and the pop-flavored “Letter To My Girlfriend” were all recorded in one glorious day in New Orleans in 1953 (with piano backing from Ray Charles). How’s that for a good day’s work!!! The ATCO recordings sometimes get short shrift when compared to the Imperial and Specialty recordings, but they stand up very well when featured side-by-side. Slim definitely didn’t have much of a drop-off as a performer when he switched labels. Guitar Slim is one of those early electric blues pioneers that often gets lost in the shuffle among the bigger stars, but his strong (albeit small) body of work and his influence as a guitarist, songwriter, and performer on so many of the great musicians who followed should make his music required listening. This excellent compilation (with concise, but informative liner notes) should be in every blues fan’s collection.